Old-time Typeracer User Wins $5000 at Cincinnati Typing Challenge! 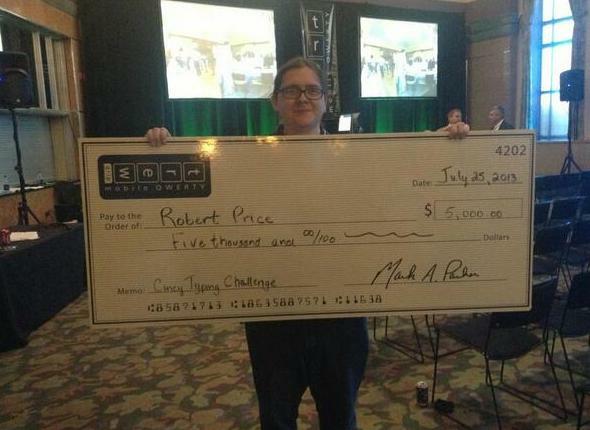 This past week, the final round of the Cincinnati Typing Challenge was held, with long-time Typeracer Megaracer Robert Price (Zapakh) winning the championship, and taking home $5000 USD. (The contest’s official website, and their Twitter have more details.) I have been racing against Robert for over five years; he created his Typeracer account on August 8th, 2008, five days after I created mine (and we did races before that, too). He has always been a formidable opponent! In the first round of the contest, notable Typeracer user Sean Wrona (his Typeracer profile; his website) came in first place, typing 173wpm on a standard Qwerty keyboard (he dropped out later in the contest); Robert came in second. In the final round, typists were required to type on a new kind of mobile keyboard called the TREWGrip. They were given 5 days to practice. In this final round, and Robert came in first place–taking home a $5000 check! Congrats man!!!! Especially when you were up against Sean Wrona and still pulled it off. He didn’t win against Sean Wrona. Sean Wrona defaulted in the final since he couldn’t make it to Cincinnati due to travel arrangement problems. I will edit the original post to make this more clear. Thanks for hosting it! Here at Typeracer we appreciate all work done to promote typing as a fun and competitive activity.